Since Brady had a few days off of school, we decided to head to D.C. for the holiday! We both visited for the first time this Summer but ended up skipping all the Smithsonian's and hanging out with our good friends instead! Amy and Jackson recently moved into the city and were going away for the holiday so they let us stay at their place while they were gone (thank you!!!!!!). They are the best. They live in such a great spot and right next to the metro, which made getting around so easy. It was both of our first time using their metro system and we were both in shock! It was so gorgeous and clean. Coming from the nyc subway, this was a real treat. Unfortunately, I got pretty sick our first day in DC. We spent the majority of our time in bed watching Netflix, but we always ventured out for food. I had a list of places I wanted to try. Trying new restaurants is one of my very favorite parts of traveling, and I was definitely not going to let being sick get in the way! 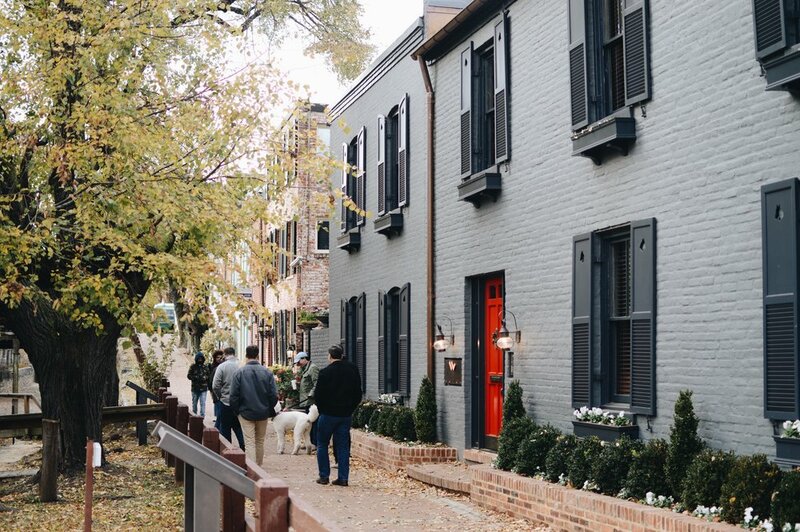 Walking around Georgetown is my favorite. I could do it for hours! As much as I hate to admit it, but I'm not the biggest history buff. But, architecture, historical homes, shopping, and good food are definitely my thing. Brady loves naps which makes these two a perfect pair. Zoe is always down for a nap and sometimes she will even be your pillow. I was really hoping we could eat Thanksgiving dinner at Founding Farmers, but when I called a couple weeks before our trip, they were already completely booked. I was really bummed, especially because I couldn't find a single place that had reservations available! I ended up giving up, and forgetting all about it until the day of, whoops! When I called FF on Thanksgiving morning, they were still booked but said they were taking walk ins. We decided to take a chance and go and were seated right away, it was amazing. Thank you Founding Farmers!! The pictures pretty much speak for themselves, but the food was amazing. I was still sick so I didn't eat much, but boy did it all taste good! Please notice that man cheesing it up for my photo! Zoo lights! They were underwhelming at best, but fun to be with him regardless! A couple self timer pics, haha! I was literally in my sweats because just getting out of bed for a couple hours was a huge feat for me. This sandwhich was SO GOOD. 2Amys, I have no doubt that you make good pizza, but this was not for me.